I continue to have notifications on the badge app icon after I’ve read/listened to messages. I’ve closed and reopened the app and it’s still there. I’ve deleted the app and downloaded again, it’s still there. I turn notifications for the app off, wait and turn them back on again and guess what? The notification is still there. Please fix this! I used to make every person I communicated with download and use this app. NOT NOW! I used to use it for 99% of my communication with my work and personal contacts. NOT NOW! Don’t let the developer comments fool you. They have been asking and telling people to open support tickets and that all the issues you see us fellow die hard users complaining about for MONTHS!! The usability of this app USED to be awesome. Now it’s a joke! If the developer reads this review, why haven’t you fixed ANY of the lag, delivery, lock up issues that I opened a ticket about for both my and my wife’s phones over two months ago!? And the lag issues I first complained about four months ago!? If your engineers know about all these issues and haven’t fixed them yet, I would find different engineers that can produce timely results. This app used to make me happy. Now it makes me sad and angry. Love Voxer. So easy to communicate with kids. 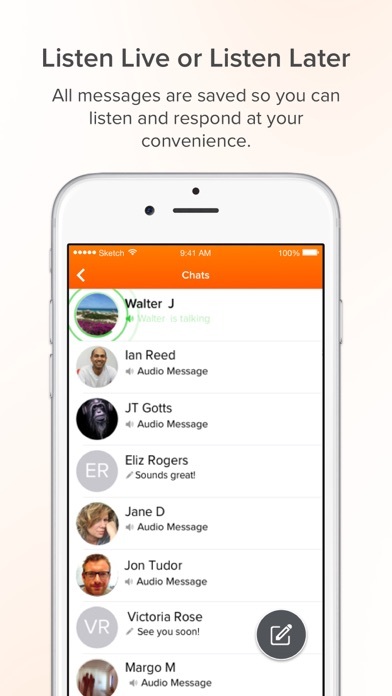 Voxer use to be great use to get every message sent to me and could communicate easily with individuals or groups. Now I don’t know what happen but in the last few updates the app has gotten worse and doesn’t work correctly. After updates the app continuously shows no network connect for almost a min before connecting. I don’t receive voxer messages until I open the app even when all notifications settings are on for app and phone. When pressing to talk it will stop recording randomly. Word of advice if it isn’t broken don’t update it!!! Cause now it’s broken and needs an major fix. Crashes every time I launch it. I can no longer rely on this app. STILL cannot “Delete” Starred Notes or clear the thread...I now have HUNDREDS of recalled Starred Notes. That can’t be the point of that function. LET ME CLEAR OR RE-START THE THREAD for THE LOVE OF GOD!! Get this right guys! I PAY you for this app, but soon won’t anymore!!! Doesn't work on iPhone X. UI bottom buttons when in a conversation are way to close to the home bar so you end up going home instead of pressing the vox button. UPDATE SUGGESTION: Add a 10 second replay/back button (like the one the Podcast app has). It really would make life so much easier!!! I currently have 4 separate support tickets issued concerning all the problems I am experiencing with this app! I used to love it, now it makes me want to throw my phone in the river! Two of the support tickets were closed before the issue was resolved, so I reopened them and submitted more! Wish I was able to find out what happened to suddenly cause this app to stop working and why the developer seems to be so unwilling to fix it. For some reason this app doesn’t like the iPhone X or XR. When the app is open and your are trying to listen to messages on speaker it blacks out the screen and locks up my phone. We use this with our fire dept as another communication tool and since I have switched to the XR it is less than stellar to use. Not sure who the haters are but this app is a life saver, literally. Incredibly easy to use (and beautiful!) this app has made communications amongst our company (hospitality) so easy and reliable. We couldn’t function without it! App notifications override other applications! Latest update interrupts all apps, most notably Overcast podcasts by stopping the audio playback every time I get a Voxer notification. It also cancels the iMessage voice message feature. I was recording a voice message in iMessage and when I received a Voxer notification it canceled my iMessage recording of which was lost. Other continuing problems: the AppSupport link is, again, still broken. With the latest updates to voxer and iOS 11 why have 2 volume controls? Volume control issues still persist with only very minor improvements. The app will show you have 2-3 notifications for every message then once you read or listen to the message it still says 1. There is no way to change this so it always shows you have a notification even though you don’t. It can be confusing. I guess you get notified 3 times per text/ Voice. Once when it sends once it’s delivered and once when its read. That’s really stupid because you can’t get the notifications to fully go away without deleting the whole conversation. There should only be 1 notification and it should be when you get a message like every other app. Especially since you can see if it’s delivered and read inside the app, getting a notification for it is overkill. I don’t like the app because of this and I don’t recommend. Use WhatsApp it’s better and also doesn’t have annoying sounds you can’t change like Voxer. A buggy/laggy poor excuse of an app. Volume control volume control volume control. The volume control on this app is random at best. If I turn the volume up using the buttons on my phone it does nothing. Sometimes I can control the volume only while audio is playing and other time that doesn't even work. Somehow if you were from the beginning, those users should be free forever. Data retention is an issue for me. Anyways, encrypted chat should be enforced. I have more ideas that would help you, but I have to stop here. I was once intensely and passionately in love with Voxer, but there have been so many glitches lately *unable to hear messages *messages not recording when you tap to talk..or recording for 1 second but continuing to glow green to trick you into speaking for 5 minutes only to find nothing has recorded. *app not playing when clicked off *randomly shutting down ALL OF THIS has been reported and I’ve basically begged for help as this is my main means of communications with friends who live far away... no replies. No cares. No more pro for me. I have been an active user of Voxer for over two years. It has really changed my life! Several of my close friends around the country (and world!) and I are able to communicate literally throughout the day, in a way that is more natural and more seamless and texting. While other apps have similar functionality, Voxer is an expert at this, and is unrivaled even after two years and trying multiple other options. It is ridiculous that it is free! Currently the fast forwarding speed is not working. When you press either 1,2,3 or 4, nothing happens .... New update? The new update on the iPhone pauses any other audio I have playing when a new Voxer message comes through. I regret paying for Voxer Pro. Super buggy. It stalls frequently. It takes too long for messages to load after receiving a notification. I tap the notification, the app switches then I wait, and wait. It’s faster to close the app and reopen it to get the messages to become available. Buying Voxer Pro didn’t help. Please fix this! I’ve used this app for years and love it but the speed button is not working. Takes too long to listen to messages. And it switches from speaker to handheld audio randomly. It’s annoying. Please fix it. currently the change speed button doesn’t work. I rebooted my phone and even reinstalled the app but it didn’t fix it. Please please please fix the speed-up mode! It stopped working with the last update. I switched back to WhatsApp. Voxer just has way too many bugs and issue for me to keep. Volume issues, playback issues, touch issues. I gave it time and it still hasn’t improved. I was using on my iPhone 8 on iOS 11.2.1. WhatsApp works perfectly. App is awesome! Use it for my business everyday. Yesterday’s update fixed a couple things but broke the playback speed. It only plays back in 1x even if you change it. Also the push to talk chime volume is very low now. The speed button isn’t working. Takes too long to listen to messages. Also please make so it stops switching from speaker phone to non speaker phone. After the new update I cannot use 2,3 or 4xs speed. Please fix! Kind of fun for exchanging voice messages, and it allows stop and play, which is handy for long voice messages (something iOS voice messages doesn’t allow). But this app makes way too much noise and I don’t like that the read receipts are not optional. Some of us don’t want to be tracked that way. The most beneficial feature is broken. When playing back audio from a message, the play 2X, 3X, 4X functionality is not working. Let me begin by stating I have LOVED this app for my iPhone and have used it for years, so this rating and review are specifically for the Apple Watch application. Currently, you cannot do anything on the Apple Watch that makes Voxer, VOXER! The main feature of Voxer is being able to send and receive PTT voice messages, yet you cannot do either on the Apple Watch. However, the UI within the Watch app still makes it appear like you SHOULD be able to do these features. For instance, the Watch app will definitely notify you when you’ve received an audio message, yet when you go to click “PLAY” to listen to the message, Voxer notifies you that you must “Play on your iPhone.” You also do not have the capability to send an audio message. If you attempt this by clicking the microphone option for a response, it will listen to your message and transcribe it, and automatically send that message as a text in the Voxer app. Essentially, Voxer for Apple Watch is a less convenient and less capable text messaging app than you already have as a permanent app on both your phone and watch. You ARE able to view text and picture messages you receive within Voxer, you simply cannot send or listen to audio messages, which to me and most Voxer users is the single most important function and reason to use the app. Please bring audio capabilities to the Apple Watch app! I would love to change this to a 5 star review! This app has a lot of stability issues and is not as good as it used to be. My girlfriend and I love using Voxer to communicate. Sometimes she sends me messages from the other side of the apartment. Sounds crazy but it’s actually very useful! 5 stars! Eliminate meetings and calls! But very buggy. I’ve been a Voxer user for years now and pay for the pro version just to support Voxer (not bc I need the features). I started using it at work - we’re a highly distributed company across multiple and international time zones with insane travel schedules. It’s not unusual for me to have 10+ meetings in a day, so time is tight. Voxer has literally reduced the number of emails I get, and has eliminated the need for many meetings and calls. It’s so easy to just Vox someone a quick answer - easier than texting it, easier than typing it - and because it’s voice - you get the emotional context of the message as well. I can vox and drive. I can vox and walk. I can tell if someone is being passive aggressive, or they’re angry. And the interface makes it far superior to what native ‘record your voice and send’ can do. I’ve found myself listening to a particularly good explanation or description multiple times to make sure I have it. I forward voxes so I don’t have to restate what someone else already said. It’s just easier to get everyone on the same page. Now, there are some best practices you must follow otherwise voxer will be the death of you. No voxes longer than a minute, unless you warn people. Be efficient with your voxes and force others to as well. Do NOT say in 300 words what you can say in 5. Recall Voxes liberally when they’re inefficient and try again. Eliminate “Uhhh”, “ummmmm” etc from your vocabulary. Put your entire team on a single voxer thread and you can probably eliminate at least one if not multiple meetings a week. Do not put “todos” in voxer. Use email or slack for that. Voxer is for urgent time sensitive things - so don’t put trivial crap in it and correct others who do. I tell people I’m ALWAYS responsive on voxer, but I won’t check my email on nights and weekends anymore. So if it’s urgent, people know how to reach me. Now the downside is that voxer is super buggy. Always has been. Sometimes the button doesn’t work. Often the thread will show an unread even though you’ve already read it. Sometimes the badge count will be wildly wrong (like now). And I always wish there was a screen of frequent contacts - rather than just most recent (although recent is good too!). 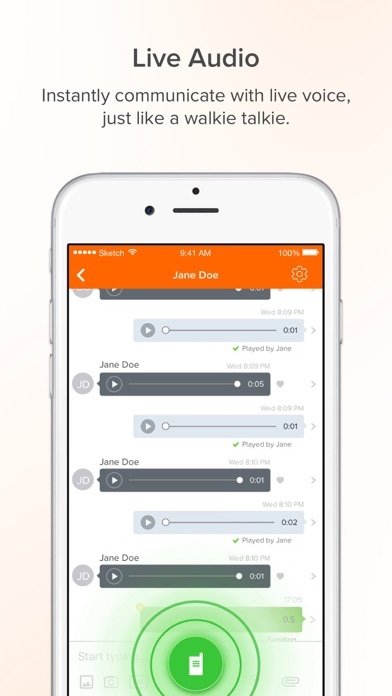 Voxer - seriously. Clean up the code! I love you but it’s messy. It’s why I gave you a 4 instead of a 5. Now I also vox my husband primarily. And my kids. And my parents. I wish everyone I knew was on it. So much better to “hear their voice” and for those of us not internet native, it’s much faster than texting. And it gives you the emotional context that a typed word does not. Plus you can still type if you want to! Voxer, I love you. After the Apple update there’s tons of notifications but no unheard messages. They won’t go away! It’s hurting my type A. Just did the most recent update (8.30.18) and the badge count is still not fixed. I still have notification but have marked all have been read. It’s driving me crazy. I’ve been having bugs where it’s hard to hear some messages. Or I can’t send a pic because the gallery is covering the paper plane “send” button. Still love it and still gonna use it. But it always says I have one message no matter if I have marked them all heard. Please fix the badge count issue! I am still showing 60 messages even after the “fix” Update*** Developer contacted me directly and helped correct the issue. It says the badge count has been fixed but mine didn’t change. Still having issues. I love this app but some things could improve. I’ve updated everything, powered off and on and the msg count is still constantly 1 on my voxer notifications!! It’s so aggravating!! This has been an ongoing issue for MONTHS! Voxer has bugs, and the developers don’t care. I have used Voxer for nearly 5 years now. Through the process, there have been many bugs. The developer team has been slow but has eventually ridden the app of most bugs. There is a concern, however, that has never been fixed and is seemingly never going to be fixed. The notification system is out of control. The badges are almost daily misrepresented on the app. Listening to a vox message very often does not clear it. They include a button called “mark all as heard” and this button fails at doing its job quite often. I have emailed the developer team, and they responded with a message explaining that I was using the app incorrectly and I was at fault. They have released multiple app fixes that claim to fix the issues, but they do not. And, for the record, this is not my device exclusively. I know many people with the same issues. And my phone is not outdated, either. I have iPhone X. Overall, Voxer is a good app just because of how many people use it. It’s pretty convenient. But the bugs and the lack of care the developers give is really frustrating. I am not giving this app 1 star because that would be very harsh for a pretty good app. But when an app is unusable do to glitches that the team is fully aware of yet refuse to fix... that’s why I must rate this app so poorly. Respect your clients. Respect your users. We are what got you successful. Update: deleted all stored messages after failed attempts to hear all. Notification still up with zero messages, deleted n reinstalled, and even restarted phone. NOTHING WORKS. Unable to send photos since the new iOS update. Also, the badge count issue is still an issue. Please fix the badge count issues. I was excited to read a mention about this in the latest update but instead it sounds as if you’re directing everyone to do what we’ve been doing all along, to mark all messages heard. That does not work. There is a bug. Please help. Also, can you please change the setup to only include actual chats in the chat feed? I have all these possible chats listed with people in my contacts. I’ve never chatted with most of them and would like that in a different area of the app as it’s confusing and cluttered. Thank you. I’ve been committed to voxer for years but find its constant glitches frustrating. The recent update did NOT fix the badge notification issue- shows unheard messages even when I have none. I love being able to speed the replay of messages. I’ve gotten several friends to join voxer to keep us close but have considered switching apps. Support staff is responsive but I wish the app were more solid. Have used voxer for years and the last update said it was to fix the count on the badge app. I never had this problem, but now I do and its driving me crazy!!! The update made the problem not fix it! I clicked “marked all as heard” on every string - still have 1 badge count. So annoying. You’ve released several updates the last few weeks...even with today’s update it’s still broken. Why can’t you fix this voxer? Yep...badge count is still there on my voxer icon. Tried multiple times, as well as shutting my phone completely off. Otherwise, love the app! I keep in touch with my family and remote team across the US and love being able to send and listen to the quick voice messages. Vox me! So far I’m loving Voxer! Great app for communications. I still love the voice option especially when walking and working out! I have 1 notification which won’t go away on the Voxer icon. Super obnoxious. You get a non existent message from a friend, and when you install the app to see it, it gets all your contacts. I'm reporting this. My app still shows unread messages even though I’ve read/listened. SUPER ANNOYING!!! I’m sick of my Voxer saying I have unread messages!!!! It’s been like this for months!!! I have used voxer consistently for 5+ years. But with each update I swear it gets worse and worse and less reliable. For the last : months I’ve had 4 notifications that I can’t get rid of but zero unread/heard messages. Now messages are only partially loading. I have paying clients leaving me messages that I can’t listen to. Whatever you guys are doing stop and go back to the way things use to be. This is becoming a very unreliable app to use. Back to back issues. But no other app like it. Overall the app is useful and is good for communicating. The badge count not going away is aggravating. The “fix” of marking all heard unfortunately does not work most of the time. Please fix this function! Update: The developer responded quickly to my review about the badge count issue with a fix. It did resolve the issue. Thank you! When Voxer is working it is GREAT! I love using it to stay in contact with friends. BUT every few weeks it decides to not deliver messages. My friend sent me a 10 minute message that won’t play on my device, on my PC, no where. And now it won’t playback on her device either. (She has contacted support). We were going strong for about 3 weeks with no issues but today messages started not playing. If it weren’t for issues like this I’d pay for Pro, but since I’m averaging only a 90% success rate with messages. I’m hesitant to drop the money for pro version. I have had several issues with the app over the few years I have used it. Right now, since the recent update, I have a notification which will not go away, no matter what I do. I have tried to reach the developers, yet there has been no communication. I have had the notification for over two months now. If my family didn’t use this app, I would not use it. I do not recommend it. Voxer has been a wonderful tool for me and has been extremely reliable. I recommend it to anyone looking for the capability to leave longer form messages while on the go. Please fix the badge notification issue. This app has had multiple updates claiming to fix the issue which was false information. And please stop telling customers that all they need to do is “edit” and “mark all as read/heard.” Again, false information and those actions do not fix the error. Thanks. I use this for work and it keeps saying I have comm and don’t. Then when new comm does come in it won’t alert me. I have cleared it, removed and updated the phone repeatedly. I have followed the steps given to others and nothing is changing. This didn’t happen until I updated my phone so it would appear that the app may need some updating to keep up. Definitely annoying to miss work comments!! I’ve been using Voxer for years and suddenly it’s TERRIBLE! I love the app but it’s “mark all as read” button does not work despite releases that claim they fix it. It forever says I have 3 new messages and I do NOT. So frustrating. Please fix!! I originally loved this app as it’s so easy to use for communication, but I keep seeing badges saying I have unread messages when I really don’t. The most recent issue is that all my messages just disappeared! I tried deleting and then re-loading the app, which worked for one day. The very next day they were all gone again except for a few messages from the first contact on my list. This is so frustrating!! Thank you for finally fixing this. I have always loved this app. Me and my family use it more then actually text messages or voice calling. Now if you were able to make it so we could access shared pictures easier instead of scrolling through the chat to find it. The best ever! Immediate delivery. Only one button to hold and talk. Safe while driving and it's live real time, reliable! I love it! Push one button not 2 or 3 to talk like whattsup app. Very efficient, no need to text! I love Voxer. Reliable, too. I love that it is real time. I can send links from Safari. I can send Pandora and IHeartRadio music links to share with my friend. Of course pics! My friend can see where I am driving or at live! My friend is a USA marine in Kabul, Afghanistan currently! Thank you Voxer for bringing my friend and I closer!! The notification system is sooooo annoying. My badge shows 17 unread messages. Not so. I have done everything I can to clear the wrong number and all to no avail. So frustrating. My Voxer refuses to work no matter what I do to reset it. I have worked with my cell company technicians and the have tried everything on my end; the problem originates with your app and I have sent messages through this window, I lost count of the many times I have “opened tickets” as Voxer requires and “NO ONE” has responded to my inquiries. And I paid the yearly fee to be a PRO but that didn’t change ANYTHING!! My Pro acct expires the end of this month and I have not been able to use it since March!!! This has gone on for months!! Very disappointed!!! Telling me to go in and manually clear the notifications when they are wrong is not a solution, it’s YOUR job. I have dozens of other applications that don’t tell me I have a new message when I don’t. Because I don’t believe your badge count, when I ACTUALLY have new messages I don’t check them. Also I have manually cleared all notifications in each conversation and it is still telling me I have unread messages through badges. If you can’t fix this you don’t deserve users. Update after their suggestion: it cleared out instantly! Thank you!! Mark all heard not individually, but from the main page. I have been a Voxer user for years...great app that is so useful! Please fix the badge count! And also many of my messages won’t push thru unless I open voxer up, leading to missed messages! This is happening to the people I work with also. Needs polishing right now, but amazing app. New iPhone XS model support?? Please update app to support bigger screens on iPhone Max models!! Thx. Go to my Voxer chats and it says no internet connection? I have WiFi sand also 4 bars of Lte so this makes no sense. Also I listened to my messages and the app still tells me that I have messages to view? Please Fix these issues. Very concerning. Very glitchy. My company uses this app every day and there are several key functions (like voxers not delivering to my employees and partners) that the develops via email don’t care about. I email back and forth with them every day and they just give me the runaround. They insist they do not have phone support, and their email support is complete garbage. Terrible. Even the Pro version. It’s a real shame. No matter what I do, I even uninstalled it and reinstalled it and no matter how many times I clear my messages or “Mark all heard” my phone still says 5 unread messages it’s annoying. I’ve been having issues with the Voxer app for months. I see this update available for correcting badge notifications. I thought it might help my issue but instead it gave me the exact problem the update was supposed to correct. This is one instance in a long line of disappointing changes by Voxer. My loyalty to this app is waffling. Update: I put a lot of weight toward companies that reply to reviews which Voxer did for me. I appreciate that. However, the problems I have with the app remain. I’ve done updates that have given me more issues without fixing old ones and it’s frustrating. I am having a huge problem with message coming through. The message shows up but won’t play. It isn’t a “failed upload”, it just won’t play. I have updated my app, uninstalled and reinstalled. What is going on? I’ve used Voxer off and on for years. My previous experience was great, but this last one? Not so much. Messages wouldn’t come through on my end, no matter how many times I refreshed, signed in and out, disconnected from WiFi and connected again, or powered off and on my phone. It was only after D A Y S that a new message would show up, and not even then would a notification come in. I got this app to get connected to friends overseas, but it just made me feel even more disconnected than before. I like this app and use it daily, BUT I can’t wait for the badge bug to be fixed....AGAIN! So distracting to see the number of unread messages when there are no unread messages! Thanks in advance for a quick fix! When I first launched Voxer with the group of Transportation Professionals I work with we enjoyed it and the bugs were quickly resolved. However, lately it seems that the Internet Connection keeps getting cut off and it’s not my phone. All other apps on my phone work fine, and with others as well. I have deleted the app, re-installed and it is still jacked up. I am looking for another way for us to all be able to communicate without Voxer going forward. Wish you all could figure this out. I’m extremely close to deleting the app because they keep faking notifications. Fix or I’m gone. EDIT: contacted by devs. Told them same thing everyone else had. Still broken a and they refuse to fix it. WORST DEVS EVER and product team doesn’t get it. Final verdict: Don’t download. I’ve been a daily voxer user for years and as much as I love it, it’s been so glitchy lately that I’m looking for other options. The messages I receive don’t always come through and I’m unable to do anything to retrieve them. Even if the sender resends the message, texts the message, emails it and I open it in another device...it’s lost in cyber space. They can listen to the message on their end just fine but it will never come through on my end. I would love to know how to fix this (relaunching and/or reloading the app doesn’t work). I’m so frustrated! I love this app for its purpose, but it’s been making me really angry with its glitches over the past year or so. The developers need to get their act together and make some fixes. I love this app.. but for a couple months now my notifications number has stayed at 5 and it drives me nuts. I have deleted the app.. deleted all messages and nothing seems to fix it! Help Voxer!! I was frustrated with the app not working (badge icon constantly saying I had 16messages) and got a message from tech support who helped solve the issue. Very impressed! Thanks! I really love using this app! As a stay at home mom it’s not possible to sit on the phone but with voxer I am able to have important conversations when needed. Thank you! I can’t make the notification icon reflect the actual ZERO unread for TWO VERSIONS NOW, and frankly am flabbergasted my iPhone 7+ doesn’t have a HOLE IN THE SCREEN where the mark all read option lies!!! I have to turn notifications OFF, which nullifies any value the app can offer!!! Edit: can I PLEASE rate NEGATIVE stars for a “response” which paid ZERO USEFUL ATTENTION to the actual content of my review?!? If these people are THIS clueless, it’s absolutely no wonder they can’t kill this LONG RUNNING BUG!!! Love this app use it to communicate with my business partner across the country mostly - but does the job! For about 2 months I’ve had the app tell me I have 2 notifications, but I don’t. I’ve gone in and said “mark all heard” but still nothing. Also, I only get notifications about 50% of the time and if I don’t manually open the app, I might not get the notification that I have a message. Really kind of a bummer since I use this almost exclusively for my business. All of my conversations have been completely wiped out. I had cherished conversations that I was saving, but in their effort to get people to buy the subscription they now have gone to a 30-day delete policy. I uninstalled it. I’ve spent hours trying to figure out the solution and realized this is a bug that the devs haven’t fixed, after reading on the internet I found it’s been like this for a while. Goodbye Voxer. The badge count bug is still not fixed - very annoying. Bunch of other bugs too - in an app for which I am paying $30 a year, this is unacceptable. So done with this app. Been on it for 5 years and every update makes it worse. Now I can’t control the volume within the app. It’s always been difficult to hear the other person anyway. Push notifications don’t work so me and other users have to text each other half the time to “check your Vox” and other times when it says I have a message, I open the app and it’s not there. I have to close and reopen to get it to work more times than not. Overall, it’s complete crap now and I’ve gone to another platform. We desperately need an update. I have an iPhone and do not get a notification if I have a new message. All switches are turned on for notifications. I have several friends with iPhones and they ha e the same issue. My friends with Androids do not have the same issue. Since this update I’ve had nothing but problems. Can’t send a vox without swiping off the app and restarting. Now can’t see one listed that I got a notification for. Very frustrating!!! The app keeps telling me that I have messages from people but when I go to look at it nothing is new but the notification doesn’t go away! I have 3 notifications right now that I can’t get rid of no matter what I do. Ive used this app for over a year. The last two months I’ve had to delete the app and add it again. Every day! Im sick of it freezing!!! Messages will not send unless I close down the app and open it back up. Tested WiFi and cellular on my phone both are functioning fine. iPhone 7 Plus user. Please help. Are used this app as an artist to communicate with hundreds and hundreds of other people. Before I paid for the subscription I was able to locate any conversations that I had not deleted. Once my subscription was over they basically threw everything in the trash and told me to upgrade for more space. This was never a problem with this application. I was considering upgrading just because I liked the cushy set up but now I’m realizing they just want me to give them money and the free ride is over. If you don’t subscribe then you’ll always have a decent application don’t worry about the bells and whistle’s. I’ve sent complaints of issues via the app support link. Never got a response. This app was great when I first downloaded it years ago. For the past few years I’m experiencing.. 1) no notifications. I have to manually open up the application only then seeing that I received a message 2) notifications not going away. After I view a message, the notification icon will not go away unless I manually select to show all messages viewed. 3) my messages count towards notifications. I’ll send a message to someone and it will show the notification on the app and message as a new message. I have to repeat step 2. 4) freezing. The application freezes at random and I have to back out, force close and restart to fix. When I first downloaded this it was amazing! I even upgraded to pro! Now it's lag city. The convenience of communication by Vox is overcast by the amount lagginess. It's kind of like buying an automatic transmission car that stalls out and dies on every single red light. I mean sure, theoretically an automatic is more convenient than a manual car. But if it dies every single time I stop? NOPE! Gimme the manual car back cause it at least has some reliability. That's what Voxer is. A promise of something awesome that gets absolutely destroyed by bugs and lagging. What bugs you ask? Well: - Audio stops when I exit the app (about 50% of the time) - Audio stops when I lock my phone (about 75% of the time) <-- This one is MASSIVELY annoying - The button I press to talk doesn't register at times - Messages will partially download despite being on high speed internet - Absolutely unusable on my computer - Notifications are a hit or miss. Sometimes I get them, sometimes I don't. And I still have a little notification icon after I've caught up with everything. I wish I could use this but I'm definitely not going to be renewing my pro account after dealing with this. I'll take a simple text message that's actually reliable any day of the week. Literally doesn’t even work. It crashes with anything I try to do. REALLY hope y’all fix this soon, it’s a major part of what I do. When I try to retrieve my messages I suddenly need to log in. Why do I repeatedly have to do this? While I’m logged in, just by switching windows I have to login due to error. These “errors” need repairing! It is time consuming, frustrating and counterproductive. This app used to be great, but now I don’t receive messages and recipients don’t receive my messages. If the app is left open and you go about doing other things on your phone, then you get a Voxer notification and go back to the app, it is frozen. You can’t do anything. So, you have to close the app and go back in. Also, if you get a notification and go into the voxer app, it says connecting and there is no message. Don’t waste your time downloading it. They should make it very easy to delete messages! After listening to a message the Notification stays on ! I played all the messages and it still has it showing that I have a message ! Very annoying ! Voxer will not work on my iPhone X. When I click on a message to play it, Voxer crashes and exits. I submitted a support ticket a couple of weeks ago and the response was that it was a known bug. But there has been no resolution. I’ve been using Voxer for years now and I’ve always had good luck with it, but lately it’s gotten irritating in terms of the speaker settings and other glitches. If you accidentally put your hand or an object over the sensor at the top of your phone and remove it, the message you’re playing gets insanely loud. You have to pause that message and exit out of the chat and go back in to play it to go back to normal sound. It also doesn’t let you adjust volume whatsoever when in the chat. Lastly, the app doesn’t always alert you when someone is talking, but this isn’t too common. Otherwise, the app runs pretty smoothly and it’s a convenient medium between talking on the phone and texting. My boyfriend is on a cruise & we have had little to no communication. Nothing would work. 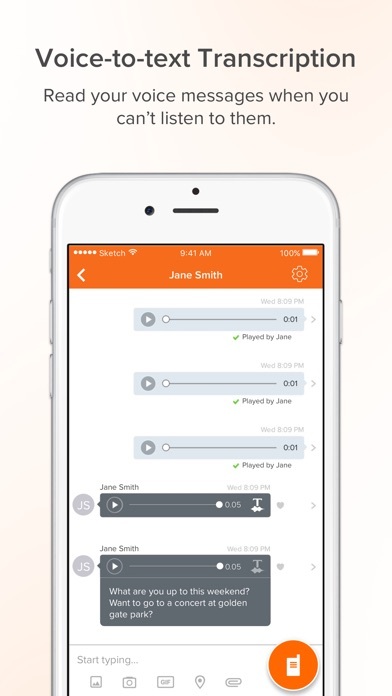 No imessage, voice messages on FB were fuzzy and unclear, until we thought of voxer and the sound was so clear and crisp and we could talk just like we were talking on the phone. It is perfect! I can't thank this app enough!!!! Voxer used to be quite useful. Now there are so many glitches: icon notifications for read mail, no notifications at all quite often. Today I received 6 messages 5 hours after they were sent to me and I was on high speed internet the whole time. Also, please fix the auto-speaker phone thing. You should be able to have it set to always be through the phone and not have random messages coming through the speaker. I'll give it one more update. This app was working great, now i can’t listen to any messages without hooking my my headphones first. Also, the app will randomly quit and close out. Please fix! I have been using this app for years! I tell everyone I work with to download the free app. I use it many times over daily. Other than the occasional problem Voxer has worked great for a free app. I have no complaints. Don’t believe the haters. If you have a sucky cell phone provider who throttles your speed then yes you will have a major problem. I will be using this app for years to come. When you click recall you expect the message to disappear on both ends immediately. This is not the case. It will delete eventually. THEN, it TELLS YOUR PARTY THAT YOU RECALLED THE MESSAGE or messages. So of course they ask putting you in an awkward position. Everything else is cool. It gets 1 star for ruining a friendship. I love this app makes it so much easier to stay in contact with friends who live far away. None of us like talking on the phone so this works out perfect! My only issue is recent just starting yesterday I’m guessing after the latest update, I can’t listen to any voxers I can’t send any out, vocal or text. So a little frustrated but I’m sure the kink will get worked out. I paid for this app thinking it would work as a hands free walkie talkie when riding my bike with friends. Doesn’t do what it says and then sends contact requests to every person in your contacts without asking. It says it wants access to your contacts, but doesn’t tell you it will initiate a conversation with every user in your contacts. This violates a court order not to contact someone and could land you in jail. What were they thinking? If I could give this app 0 stars I would. I’m struggling to get my money back now. What a terrible racket. Avoid at all costs. I would gladly change my review if this app could be fixed. I don’t get most of my notifications anymore, as do other family members, so I know it isn’t my phone. I hate that I can’t use it in my vehicle if my Bluetooth is on. Everything else works through my car that way, and it won’t play any sound at all through my phone speakers even when I’m in the car and have Bluetooth on. It’s so dumb! It’s laggy and quite frankly annoying at times. This is the way most of my family and friends and I connect and I’m not happy is doesn’t work better. Why is this app all of a sudden the worst? It’s been months since my friends have gotten my voxes on time. Now they show up several days after I sent them, and they’ll only partially download. I’ve tried updating, deleting, redownloading...what the heck?? I love Voxer. It has made my life and business so much easier! I do wish I could use the walkie talkie on my Apple Watch but other than that I love it! It used to work but for some reason on my iPhone X nothing works. Can’t send voice message. Can’t message. It will just freeze up and crash. Tried uninstalling and reinstalling. Nope. Tried clearing out open apps. Nope. Nothing works. I used to love this app. Now my messages won’t send. It tells me repeatedly that there’s no internet connection and messages stay in “Sent” mode instead of being delivered. So frustrating. No dark theme like on Android!?? Seriously you guys need to put dark theme on here, if you can do that that would be great! Thanks! First I tried AppSupport link is still broken. With the latest updates to voxer and iOS 11 why have 2 volume controls? Both the app and the iPhone’s physical buttons don’t work. I’ve been using it for about a year. I like the pro version best but both are good. I hate texting because you can’t tell someone’s tone of voice. It’s great for talking to friends who live here in town or keeping in touch with family who is far away. No app is perfect. I use Voxer for about 80% of my communications and all of a sudden last night it won’t allow me to interact w messages or post or record a message. I’ve checked the settings, gone they the troubleshooting on the support page and he led for updates.. please help! This is not good for my business. The app is good, when it works, but it often stops sending messages, especially audio messages. Sometimes deleting the app and reinstalling works, but not always. What’s the point of the app if the voice recordings don’t send and receive? So what is going on? I have trouble with this app almost every time I use it lately. It’s been the sound that is the issue. I keep it on speaker all the time but there are times when I go to listen and it’s on the phone setting. Also, lately I can’t adjust the sound in the app. Whatever sound I have it set at when I log into the app is where it is set. I have to log out and then adjust the sound and then get back into the app. It’s getting frustrating! Just stops working. I loved it though. The sound just quit and cant hear anyone anymore. Just like that. No more voxing. Absolutely LOVE Voxer!!! Always use it on mission trips with my church but still continue to use it just for everyday life! I’ve become so lazy at texting now because I use Voxer THAT often. So much easier than texting/calling and has honestly built and strengthened relationships with long distance friends of mine. Since the latest update The app isn't allowing me to send photos or access the mic. When I go to my settings to turn these on there isn't an option to turn the mic or photo access on :( So basically at the moment this app is useless except for texting...which I can do, through the messages app already. I’ve used Voxer for years now. I literally do 80% of my communication through it on so many levels of life. It is so nice to be able to get back to people in my own timing but not be chained to a real phone call. I have 4 kids, so it’s not always conducive to take a call. But I can quickly respond to someone in the little moments of my day where time allows. I also love being able to speed up other people’s messages if need be. And the group feature is awesome. I use it for work groups, church groups, etc. This app has dramatically made my life more efficient. The only thing that was tough at first, was that not everyone was on it in my social sphere. But as I let people know how it helped me, they would jump on & see the benefits. I loved this app and have used it for years, especially in the car when I’m tempted to text. Now it is very buggy, the biggest problem of which is that I only get notifications about 20% of the time when I have a message. It is also very slow to register me pressing the button when I want to talk. Last thing is that when I am using it through my car stereo, connected through Bluetooth, if I use Voxer or get a vox, when I’m done whatever audio app I’m using for music or podcasts will completely close, and I’ll have to reopen the app from scratch. Very annoying if I’m going back and forth between a podcast and a conversation. None of my other voice activated apps do this. I’ve been using Voxer for about 2 years, pro user for 1 year. Until 2 weeks ago, I loved it. I used it with friends & family, but more importantly, I used it in my business. I have my whole team on Voxer and it was a great platform for communicating with the leaders in our organization. Then it stopped working. I can receive voxers, but not send them. Yes, I’m on the current update, and yes, I have tried deleting and reinstalling the app. Don’t get dependent on this app for your business, because when it flakes out, you will be screwed. I will update my review if this gets fixed. I love this app. I use it to communicate with my family and friends since I’m living overseas. The only issue is that sometimes messages don’t go through or they don’t play. I’ll receive a new message from someone, but when I go to play it, nothing happens. I love Voxer, it is so much easier and quicker than texting or phone calls. I love using it to connect with my my friends and family. We cut down all the email back and forth and get so much more accomplished through voice, but on our own terms. You send quick voice snippets back and forth so everyone is on the same page. The app itself is great in theory and when it works right, it’s great. There is a feature where you can lift the phone to your ear and it plays audio like a phone call. But if I accidentally activate that it won’t go back to speakerphone. Doesn’t matter if I restart the app or restart my phone. I have to physically uninstall the app and reinstall it. Everyone I work with uses it otherwise I would have given up on it by now. I would have given Voxer a 5 star up until I just did the most recent update on my phone. Now you can’t adjust the volume while you are talking to someone. Also you used to be able to choose whether you wanted it to be on speaker or just on your phone. There used to be a little phone icon at the top , that isn’t there anymore. I have to delete and reinstall the app about once a week. The speaker choice function is gone. For some reason it decides to go into phone mode and you can’t change it back to speaker mode. You need to add a choice in your settings of permanent speaker, phone or automatically shift between them. So by adding those three choices you might have less problems. Great app. I use this for my Professional Home Inspection business to record notes, as well as, have my employees take notes in a group chat. It’s great to be able to take pictures directly through the Voxer app or use pictures from my iPhone camera roll. Much easier, faster, and convenient than using text messaging or the 90’s method of pen and paper! Thanks Voxer!! From: Ohio Property Inspection Services Andy B.
I don’t know why, but after the latest update I can only play messages by holding the phone up to my ear. I can no longer play them via speaker phone. This needs to go back to the way it was or I won’t use this app anymore. I don’t like holding it up to my ear, especially when driving bc it looks like you are speaking on the phone which is illegal. Is conflictive with other apps such as Pandora or other music apps. Voxer works great but with a recent update, the speaker icon at the top of the chat disappeared and I can’t toggle between phone speaker and phone. My phone keeps putting it through the ear speaker instead of the loud speaker so I can actually use it like a walk-in talkie please fix been going on to long! 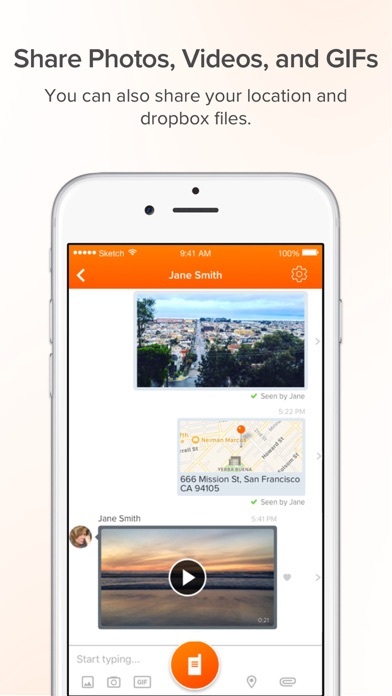 Voxer no longer sends pictures or audio messages. Just gets stuck in sending. We use this app to communicate at work and now our entire staff is frustrated. When the app functions properly it’s amazing. I’ll change my star rating if it ever gets fixed before we end up finding another app similar to use. The phone icon is now missing so I can’t switch between speaker and phone. Fix that and it’s 5 stars. First I tried AppSupport but the link appears broken. With the latest updates to voxer and iOS 11 why have 2 volume controls? Both the app and the iPhone’s physical buttons don’t work. I’m sure it’s a bug that hasn’t been fixed but hopefully there will be one soon. I used to love this app, but over the past few months, messages have not been sending properly. Very spotty. I have been using this app and loved it for a long time, but recently when I receive message I have to open my app twice so the notification goes away. Cool app but notifications don't always pop up. And when you pay for pro, there should be extra features such as being able to set different alert tones for different people. Update 10/15/17: Notifications have stopped completely. And now when you open the app, it states “no internet connection” so you may have some messages but t can be hours before they will come through. Being that this is used for business - another solution must be sought. Previous versions of the app allowed you switch audio sources directly from the chat, which was a great feature for when you’re in an environment where you are able to listen to the message but don’t want to play that message loudly over the speaker which is does now by default. Have loved this app, but won’t send any of my messages for the last week now. Hey guys.. overall I love the app. I’ve recently downloaded the new iPhone update as of 10/15/17. Now when I open the Voxer app to listen to an audio message the sound only comes out the little speaker I put to my ear. There is no little phone icon in the upper right hand corner so to switch it to the big speaker. Am I doing something wrong? My family members all have it on theirs but I can’t seem to find it on mine :/. Please help. Started a new conversation and a different, previous name is showing up in the new conversation. This is troubling because the name showing is someone that passed away. Please fix this! Works great for me I use it in the Executive protection field and it’s great and discreet. Needs new update, can’t select speaker or ear piece anymore nor can you control volume of messages. Seems like Voxer really doesn’t care if their app runs like garbage. So, I love this app. It has such a perfect place between texting and being trapped in a conversation. I love it! However, I gave it only 3 Stars because the notifications do not work. I’ve missed many conversations, plans, etc because it doesn’t tell me I’ve got a message. My husband will send me a Vox and then text me to tell me to check it. Having to add another step just defeats the purpose of it. PLEASE fix this. Sending out messages works only three times then It won’t send anything anymore. Please fix. I have LTE and wi-fi enabled and it still won’t go through. Why? I’ve never had any issues with Voxer until this last week! I record a message and it just keeps saying it’s ‘sending...’ days later it still won’t send! I can send a text via voxer but not audio. So weird! I’ve uninstalled and reinstalled, did a hard reset on my phone, made sure my phone was up to date too and nothing has helped! Please fix it! I love Voxer! Tired of only having the option to recall “My Notes” and “Starred” notes...LET ME DELETE THE CONVERSATION for darn’s sake!! Get this right guys! I PAY you for this app, but soon won’t anymore!!! Can’t send videos,what’s up with the iCloud login? I’ve just updated to 11.2.2 and 11.2.1 both ask for iCloud password when opening Voxer. Seems as though it’s only Voxer not any other apps. For some reason I can’t send videos. The AppSupport link is, again, still broken. With the latest updates to voxer and iOS 11 why have 2 volume controls? Volume control issues still persist with only very minor improvements. The AppSupport link is, again, still broken. With the latest updates to voxer and iOS 11 why have 2 volume controls? Volume control issues still persist with only very minor improvements. The only problem I have with this app is when I get a notification, or open the app, my music stops playing. Music support is on, so I don’t know why this continues to happen. Latest update interrupts all apps, most notably Overcast by stopping the audio playback every time I get a Voxer notification. It also cancels the iMessage voice message feature. I was recording a voice message in iMessage and when I received a Voxer notification it canceled my iMessage recording of which was lost. Other continuing problems: the AppSupport link is, again, still broken. With the latest updates to voxer and iOS 11 why have 2 volume controls? Volume control issues still persist with only very minor improvements. Love this App but I can’t clear the notifications which is driving me insane! PLEASE FIX! 12-28-18 Not sure if others are having this problem as I have for the longest time now. Notifications weren't sounding off on my iPhone7, I am now using iPhone Max XS which I now receive notification sounds but I still see the download error almost daily. 1-2-19 Also receiving notifications about no internet connectivity and unsent msgs almost daily. My microphone won’t work w/ my new IPhoneX. HELP!!! I have to exit boxer every time I send a message so it will send and then go back in and re-open the chat to hear the reply. This is an awful update. After the last few fixes my voxer app is running smoothly! I love chatting with my besties and my sisters! Without having to be “on the phone”. Great App!! This app has huge potential but notifications, contact management, and message sorting need lots of work. I used this app flawlessly for 3 straight years. One day it just stopped working! It is completely broke. For myself, my wife & our son on three different devices on three separate carriers on two different platforms. We all experience the same issues. Despite three separate support tickets, and multiple emails, we still have not fixed single thing! The problems started about a year ago and still persist today! I get several requests from support asking for more details and more screenshots as if they don’t have a single clue what is wrong. I’m done trying to fix this app for free! Why have support staff if I need to do everything for them!? The app barely works as advertised and isn’t reliable for delivering notifications. The Apple Watch app is completely useless. And to top it off the customer service support team is insulting and a complete waste of your time. If I didn’t have to use this app for work I would delete it and purge it from my memory. It’s completely crap and their service is the muck one finds under crap. I use voxer everyday for work. I have a pro account and today? I went to use it and nothing was showing up it just kept saying connecting. I logged out. I relaunched the app, deleted the app and re download, did a full shut down on my phone and nothing was working. It wasn’t even working on my desktop via chrome. I created a new account and that one works fine but now it won’t let me upgrade because I have pro on the other account. (And yes I canceled the subscription to it in itunes) Im incredibly frustrated because months of important messaging is lost. And when a support ticket is sent it states that they aren’t able to return all the messages. For something that you pay for every month not sure how this is good customer service. I pay for the pro account. It crashed and I have done all the troubleshooting the “support” recommends. I have also emailed them for help but nothing has been fixed. Very frustrated. My account won’t load. I still get notifications but I can’t see anything but a blank app. I want my 4 bucks back for every month I have had a pro account. This is annoying. If I could give zero starts I would. Tried to contend support. Cannot get past the enable cookies request. Tried updating the device; that didn’t work. Stuck with locating under safari and opening that way. No support- app stopped working! I loved Voxer...used it daily. Until today. It would not connect to the internet no matter what I did or where I was. It was stuck on connecting. I was receiving alerts that I had messages but it wouldn’t let me access them. I tried updating the app, logging in and back out, turning off my phone and restarting it. I even deleted the app and reloaded it. Now I am unable to even log back in. There is no way I can find to talk to someone In customer support. I was directed to fill out a feedback form to which I got back an old email telling me all the troubleshooting things I had already done. As of right now, I am unable to use this app- one that I use daily for work. I’ve lost all contacts and messages. Not sure what is wrong with it now...but I know I have received messages bc it shows on my iwatch but when I go to my phone, it just “connecting” and won’t give me my new messages. It shows I have 15 new notifications but it doesn’t show anything new in the app. Also won’t send my messages and I know I’m on my house WiFi bc I’m getting and sending emails from my phone at same time no problem. Needs fixing. I’ve had Voxer Walkie Talkie for over a year. I’ve had to download it again twice because I can’t get my messages even though it says now I have nine. Grr. I wouldn’t use it at all but it is my friend ‘s preferred method of communication. She has Voxer Pro and no problems. I’m not paying for an app that doesn’t work for free, though. I’m a paid user and this app is extremely unbalanced and buggy. I received a vox on Thursday night and I just received it on Saturday night. This is not the first occurrence of this and happens to my friends and family as well. Also, each time I get a notification, the app won’t stop notifying me and it’s very irritating. As a paid user, I’d either a) like this app fixed or b) my money refunded. I have been using Voxer now for several years and have LOVED it! Previously I’ve given this app 5 stars... Reasons for loving this app above other messaging apps: 1) I can speed up the replay and listen to most messages at 2-3X speed. This is huge! 2) “Tap to talk.” Other apps require you to hold your thumb on the screen and if you thumb slips off? Oops! Message lost! 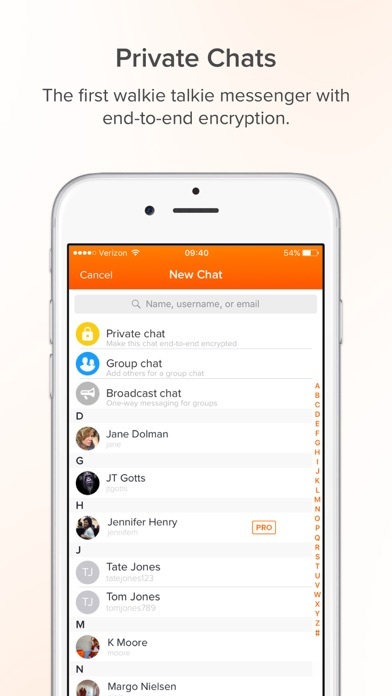 Voxer makes it easy when you just tap the button to start and stop messages. Now for why I’ve given this app 2 stars... 1) The main reason is that after one of the most recent updates, my friends and I can no longer hear each other! In order for them to hear what I’m saying, I have to raise my voice so loud it gets painful. I spend my time shouting into my phone and still they can hardly hear me. We end up using the Voxer texting but really, what’s the point of that? If I want to text, I have iMessage for that. The reason I use Voxer is for real-time voice messaging. I’ve checked my phone settings, they’ve checked theirs but nothing fixes this. I have a couple other messaging apps on my phone and do not have problems with the volume on any of those. 2) Another reason for the low rating is that, even with my phone on silent, I cannot stop the walkie-talkie three-beep chirping at the beginning and end of my messages. I find it annoying and obnoxious but the real problem is that my dog is has anxiety reactions every time he hears it. He freaks out, shaking and drooling, trying to sit on my head or crawl under me. I’ve tried to silence it without luck and that’s ridiculous to have a feature like that which can’t be turned off. Unfortunately for me, the negatives for this app outweigh the positives and I will no longer be using Voxer. App had worked fine at first and now after re downloading it because of the issue of it piling up old messages as new ones and constantly replaying them now I can barely hear any audio on the entire app. Tried re downloading it again and it didn't help. For some reason this app interrupts whatever else I’m listening to. It never used to interrupt if I was listening to a book or some music but now he just stops everything for a notification. Hopefully this will be fixed soon. Great communication tool. Very easy to use with a variety of applications! Also the new privacy chat is a cool feature! Great App!! I have been using the Voxer app for at least two years to communicate daily with a friend who lives across the country. I absolutely love how easy the app is to use, and when Voxer is working properly it is phenomenal. However, at least a third of the messages that my friend sends me I am unable to listen to. I will see that she sent me a message and it appears to have fully sent because I can see how long it is, but after the first few seconds of the message there is no sound and I never am able to hear her message. This happens when I am at home and connected to Wi-Fi, as well as when I am out and using data. I have even gotten a new iPhone and re-downloaded the app and it continues to happen, so it was not an issue with my phone. Interestingly, she has never had any of these problems.